Join us and the Los Angeles County Bicycle Coalition (LACBC) for the first Sunday Funday of the summer season! We’ll be enjoying the cool coastal air as we are joined by our LA County Affiliate LACBC for this excursion to explore our own Michigan Avenue Neighborhood Greenway and share a preview of the amazing improvements planned for the Safe Streets for 17th Street & Michigan Ave project — and so much more! We’ll be starting out at the 26th Street / Bergamot Station on the Expo Line meeting at 9:30 AM, rolling at 10 AM. There will be stops and water breaks along the way and is a perfect way to meet people, explore hidden gems and discover new neighborhoods. Facebook RSVP here for Sunday Funday! Come one, come all! This ride is a no-drop ride led by Santa Monica Spoke with LACBC Ride Marshals. Riders should be able to keep a 10 MPH pace, and cover about 10 miles. This entry was posted in #BikeSM, Bike Infrastructure, community, LACBC, ride, SaMo Safe Streets Alliance, Santa Monica on June 24, 2018 by Cynthia Rose. 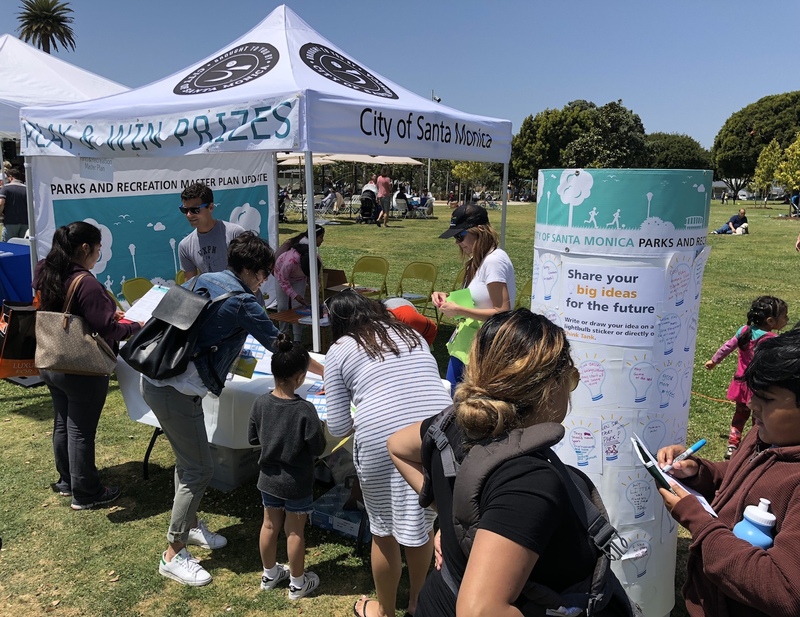 The City of Santa Monica is updating the 20 year Parks and Recreation Master Plan and has been hosting meetings with the community throughout the summer. The last planned event is this Sunday at the Summer SOULstice Festival – 11am to 1pm. We encourage you to share your input via the online survey that will be ending soon! This is a great opportunity for all of us to give input and to reinforce community support for more open space and to replace Santa Monica Airport with a Great Park when it closes in 2029. What kind of park do you want to replace the airport? Let the City know! Miles of protected bike and pedestrian paths? A Bike Campus with public bike repair facilities — a BMX track? How about coffee and snack concessions for people walking, biking and enjoying the park? The online survey that will take 5-10 minutes and will ask you to drop pins on a map for your favorite beach and park and give feedback about existing recreational programs. Near the end of the survey you will be asked about LOOKING TO THE FUTURE. This will be your opportunity to drop a blue pin to focus on the Airport and put your ideas for a GREAT PARK! Join us in supporting a Great Park at SMO: More recreation? More Sports? More Nature? More Open Space? This is your chance! Do the survey! This entry was posted in #BikeTheVote, #SaferStreets, Airport2Park, Bike Infrastructure, S.A.F.E, SaMo Safe Streets Alliance, Santa Monica, Santa Monica Airport on June 21, 2018 by Cynthia Rose. City Council discusses Strategic Mobility goals tonight. No traffic fatalities are acceptable. Traffic collisions must not be brushed aside as “accidents”: collisions are predictable and therefore preventable. Invest resources to improve equity. Our mobility and transportation systems should be safe and ensure commitment to serve as a model of 21st Century constitutional policing. All students and children have a right to walk, bike or scoot safely to school. Our transportation system should generate zero emissions. To reduce our greenhouse gas emissions and to help strengthen our community, we need a Big Blue Bus (BBB) system to be popular, efficient and financially sound. Streets are our largest public space. Street planning should integrate mobility and place-making to enhance social, economic and cultural opportunities, as well as our well-being needs. Streets are essential environmental systems. We need to design our streets as critical components of our environmental and natural ecosystems so they contribute to safeguarding water, air quality and climate resilience. Community co-creation is essential to enduring change. Diverse community voices are critical for identifying core values and the vision for transformative change, community stakeholders must be engaged from inception to completion of all projects. Data drives decisions. We need to invest in robust, transparent collection and analysis of data which is essential for understanding what the tradeoffs are and to help provide transparency when challenging decisions are made. Plan our city and mobility together. Policies on housing, open space, community facilities, commercial development, public spaces, and other land use policies should give priority to clean, affordable and sustainable mobility as it has a profound impact on our mobility options and choices. We need safe streets, designed with infrastructure that supports sustainable environmental eco systems that are safe, livable and welcoming to all. That’s the commitment of the Santa Monica Safe Streets Alliance and is outlined in our Principles for Safe, Livable and Sustainable Streets in Santa Monica. Email City Council at: council@smgov.net to tell them you support strong commitments to safety and environmental sustainability listed in the Santa Monica Safe Streets Alliance – Principles for Safe, Livable and Sustainable Streets in Santa Monica. This entry was posted in #BikeSM, #GoSaMo, #SaferStreets, Big Blue Bus, Bike Action Plan, Bike Infrastructure, S.A.F.E, Safe Routes to School, SaMo Safe Streets Alliance, Vision Zero on February 27, 2018 by Cynthia Rose.